Non-Swimmers must have fun with water sports too. Who wouldn't love it? Here are 7 water sports you wouldn't want to miss. Read ON! Dubai is not only famous for its water sports and perfect beaches; it is full of surprises for everyone with a different set of interests! Swimmers have nothing to worry about enjoying water sports in Dubai instead non-swimmers will also get to enjoy these amazing water sports that don't require swimming skills. But the question arises that what watersports Dubai has to offer to the non-swimmers? There are so many water sports in Dubai that you can enjoy and which don’t require swimming skills,such as knee boarding, kayaking, banana boating, etc. all you need to do is get on the plane, book a hotel and have the most amazing experiences of your life in Dubai. Thrill seekers are invited to have the most exhilarating experience of killing the effect of heat with water sprinkling all over your body. It is a challenging sport to try on, but it's worth trying for the ultimate adventure. All you need to do is ride the water while hopping on the kneeboard. Dubai Kennels & Cattery is the best location to enjoy this thrilling water sport. Banana boat is the safest yet fun to bring a boat that looks precisely like banana and has the capacity of up to 6 people at a time. If you want to have some fun and adventure in water with friend and family ride a banana boat is the best thing to do experiencing the fizzy waves of the sea in Dubai. Xclusive Yachts rental Dubai is the highly recommended for enjoying this water sport. 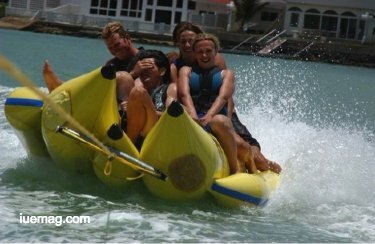 The banana boat is connected to a motorboat to drag it into the middle of the sea, and the splashes of water will hit your face along with the cool water breeze blowing the effect of heat away. Not afraid of speed? If yes, get ready for some speedy thrilling water sports ride. Jet skiing doesn't require any swimming skills, and once you carefully listened to the briefing of an expert, you are good to go. As you're not a swimmer must wear a life jacket as a precaution in case of any mishap regarding falling into water with the help of life jacket you'll easily survive floating on the water until life-guard swim in to rescue you. Nemo Water Sports Jet Ski & Flyboard in Dubai is the most famous location for this water sport. Underwater walking is much more fun than snorkeling; you don't even need to learn swimming all you need to do is wear an oxygen mask for uninterrupted breathing under water. Through this, you'll get the chance to get close to the nature underwater and discover the beauty of marine life just by walking on the floor. 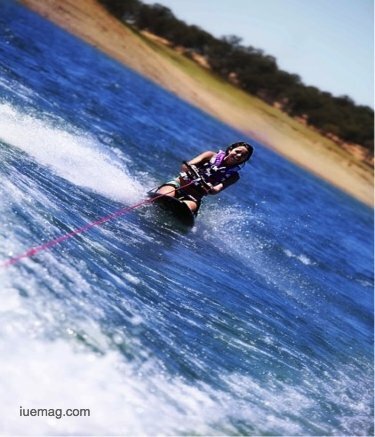 You will be accompanied by an instructor, and it's considered as safe water sport. Dubai water canal walk is the best place to go and enjoy the water sport. 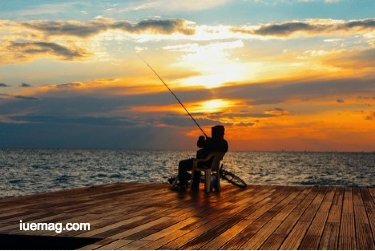 Fishing is highly recommended for all those who enjoy nature and want to spend some time relaxing and enjoying the beautiful beaches of Dubai. Fishing in Dubai might surprise you with rare species of fish like Sultan Ibrahim, Barracuda King Fish, and bluefin tuna, etc. Go fishing is the best location to go and have fun. Dubai is considered as a heaven for who love fishing all you need to do is go on a boat to the center of see. There is no restriction of any specific period to go for fishing neither it is bound to any specific month of the year to go for fishing. If you're are thrill-seeker and up for whatever it takes to go for adventures, Whenever you go to Dubai don't miss out a chance of trying this exhilarating invention, if you want to feel your adrenaline rushing in your body Flyboard is going make it happen. 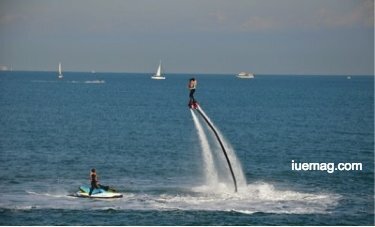 On flyboard, you can surf on the sea, go under water and fly up to 10 meters from the surface of seawater. 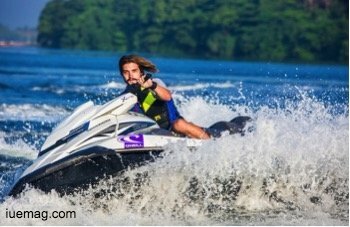 A Jet Ski and coach will follow you through your keyboard ride for making it easy to look after you in case of any unfavorable event. There is no limitation of any specific day, month or climate for enjoying the adventurous ride of this flyboard. While getting on the flyboard do wear a protective vest and helmet as a precautionary measure. For capturing the beautiful view of Dubai and underwater life at the same it, hop on your submarine that is designed as shark and moves smoothly at the speed of 100kmph. The submarine is air-conditioned. The mind-blowing experience of riding this submarine will leave you astonished it will make your adrenaline rush like anything. For riding these personal submarines, you can hire JBR, the beach and Rixos the palm. This way you'll have the insight tour of underwater life without swimming. Any facts, figures or references stated here are made by the author & don't reflect the endorsement of iU at all times unless otherwise drafted by official staff at iU. This article was first published here on 14th March 2018.